Do children who play outdoors have healthier eyes? In a time when a worldwide epidemic of myopia has been predicted ( see our recent article ), research into both its causes and prevention is of particular relevance. It used to be held that time spent staring close-up at screens in poor light was primarily to blame, but modern research suggests the near-work is not the culprit at all. A decade ago, America’s National Eye Institute (NEI) published its ground-breaking research on myopia. This showed that, if a child has two near-sighted parents, they have a 60% chance of needing glasses if time spent outdoors is low. However, spending 14 hours a week outdoors can reduce the chance of needing glasses to about 20%. Unfortunately, it would seem that extra time spent outdoors has no effect on how prescriptions change over time. The NEI now say that a recent survey of papers from countries including Australia, England and Singapore supports their findings from 2007. But why exactly is time outdoors in the early years so important? The dominant theory is that exposure to daylight stimulates the release of dopamine, which in turn results in normal growth of the eye. So sending your children or grandchildren outdoors would seem to be the way forward for healthier eyes (with sunglasses and sun cream on high UV days, of course). 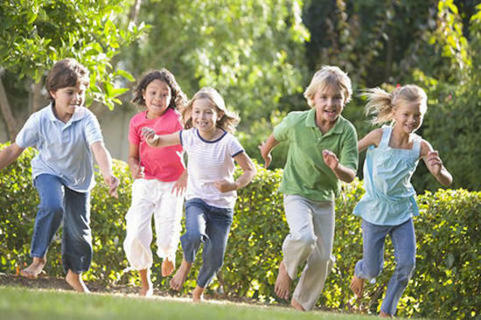 Outdoor playtime might help kids’eyesight. Playing Outside Could Help Preserve Children’s Vision.